Autologous contralateral autograft has been described as a useful procedure in patients who require penetrating keratoplasty on their only functional eye and have a clear cornea on their nonfunctional eye due to the low chances of graft rejection in autografts. Here we describe a case where we were able to salvage vision by corneal autografting in a blind patient. A 65-year-old male had blurred vision in both eyes with visual acuity of perception of light (PL) in right eye (RE) and hand motion (HM) in left eye (LE). On examination, RE had a clear cornea, sluggish pupillary reaction with presence of Relative afferent pupillary defect and glaucomatous optic atrophy. Left eye had a corneal opacity following healed corneal ulcer. RE Penetrating Keratoplasty (PK) using an allograft and left eye PK using the contralateral autograft was done. Post-operatively, RE developed persistent epithelial defect and eventually failed after 2 months while the left autograft got fully epithelialized and remained clear till 2 years follow up even after steroids were stopped. Autokeratoplasty have higher chances of graft survival due to the absence of immune graft rejection and resultant postoperative endothelial cell loss. Hence, it may be considered first in any case where there is this unique combination of opaque cornea in an eye with better visual potential and a clear cornea in an eye without visual potential. Autologous contralateral autograft has been described as a useful procedure in patients who require penetrating keratoplasty on their only functional eye and have a clear cornea on their nonfunctional eye as the chances of graft rejection in such cases are theoretically eliminated [1-3]. However, because this procedure requires a clear cornea in the nonfunctional eye and scarred cornea in the eye with visual potential, the combination of which does not occur commonly, very few cases have been reported in the literature [1,3,4]. Here we describe a case where we were able to salvage vision by corneal autografting in a patient. A 65-year-old male complained of pain, redness, watering and diminution of vision of left eye for one month following trauma with paddy leaf. He had been receiving treatment from another private centre for the last one month in the line of bacterial corneal ulcer but the symptoms still persisted. When he visited us, he had visual acuity of perception of light (PL) positive with inaccurate light projection in right eye (RE) and Hand motion (HM) vision in left eye (LE). The right eye had a small nebular scar measuring 2 × 3 mm in the inferior peripheral cornea extending from 4 to 6 o'clock position. There was presence of sluggish pupillary reaction with relative afferent papillary defect (RAPD) in right eye due to glaucomatous optic atrophy (GOA) in right eye. The left eye had a central full-thickness corneal ulcer measuring 6 × 7 mm with an overlying epithelial defect. Previous scraping report from another centre showed gram positive cocci. Culture reports were not available. Repeat scraping could not yield any growth. After 2 more weeks of treatment with fortified antibiotics (gtt cefazoline 50 mg/ml and gtt gentamycin 14 mg/ml) without any signs of significant improvement, left eye corneal collagen crosslinking (CXL) was done under topical anesthesia. Post treatment eyedrop ofloxacin was given hourly and then tapered over the next 3 weeks. The ulcer healed completely leaving a leucomatous corneal scar. After 2 months, the visual acuity was PL+ in right eye and HM in left eye. In view of the poor visual potential in right eye, left eye contralateral corneal autograft was planned. Specular microscopy in right eye showed endothelial cell density was 2375/mm3, with 45% hexagonal cells. Intraocular pressure was 22 and 12 mmHg in RE and LE respectively as measured by Goldman applanation tonometer. On 13th May, 2016, RE Penetrating Keratoplasty (PK) using an allograft was done using a donor and recipient of 8.5 mm and 8 mm respectively. Sixteen interrupted sutures were applied. The recipient cornea of the RE was placed on a Teflon block endothelial side up and the endothelium was coated with viscoelastics while the procedure in the RE was over. On the left eye, PK using the 8 mm autograft procured from the RE was done in the 7.5 mm recipient bed along with lens extraction and posterior chamber Intraocular lens implantation in the bag. Sixteen interrupted sutures were applied. Postoperatively eyedrop prednisolone acetate was started 6 times a day in both eyes. Visual acuity in RE was HM and in LE was 2/60 in the first postoperative day. Intraocular pressure measured with Goldman applanation tonometry was 30 and 9 mm Hg in right and left eye respectively. Fundus examination showed GOA in RE and 0.8 cupping in LE. RE developed persistent epithelial defect while the left autograft got fully epithelialized and remained clear. RE amniotic membrane graft was done and antiglaucoma medications started. But the graft in RE developed superficial and deep vascularization in all quadrants and failed eventually. Steroids were gradually tapered and stopped after 8 months. The graft in the left eye remained clear with BCVA of 6/36 at 24 months follow up. Although autokeratoplasty was performed as early as 1908, it wasn't until 1947 when Legrand described experimental total autokeratoplasties after which Rycroft reported successful cases of contralateral autograft in 1955 . Barraquer and Ariza who reported about penetrating contralateral autografts noted that the postoperative course was of shorter duration and uneventful when using autografts. They concluded that autokeratoplasty with a central graft had a greater success rate, especially in cases regarded as unfavorable due to issues of postoperative attacks of hypertension or inflammation or heavily vascularised graft, without the graft undergoing permanent changes . Various other case reports in literature back up these findings which suggest that autokeratoplasty have higher chances of graft survival due to the absence of immune graft rejection with resultant postoperative endothelial cell loss which is the major cause of graft failure in the long term [5,6]. As there is a lesser chance of graft rejection, the postoperative steroids can be used for a shorter time and thus the side effects of longterm steroids can be avoided. This might also be of advantage in patients with poor compliance and those not able to come for frequent followup. All other complications of PK with autograft would be the same as for allografts including postoperative astigmatism which may be the major factor limiting visual outcome . As the theoretical chance of graft rejection is nil, a larger graft can be taken with the added advantage of increased endothelial cells in the donor and decrease in postoperative astigmatism when the sutures are further away from the visual axis . 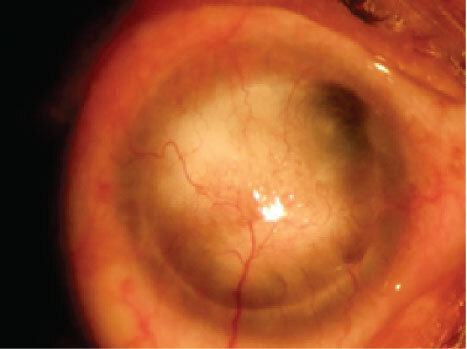 This case was an undiagnosed case of POAG where optic atrophy has already occurred in the right eye, but still the patient did not seek medical attention until his better eye developed corneal ulcer. The ulcer was not improving which could be due to antibiotic resistance which is another worrisome problem rising these days with the rampant use of antibiotics or because of inappropriate diagnosis and treatment since the causative organism could not be isolated. In this case, treatment with corneal collagen crosslinking showed a very good response and the ulcer healed leaving behind a dense corneal scar. The efficacy of CXL in corneal ulcers has also been described in various other case reports, few small randomized controlled trials and case control studies [8,9]. 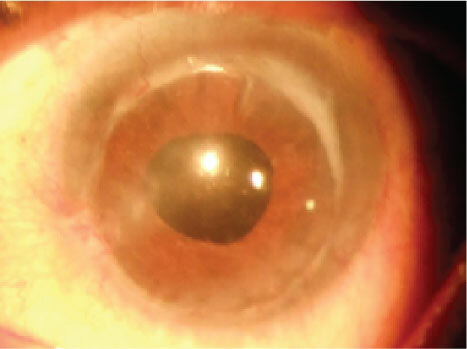 After performing specular microscopy in the clear cornea of right eye, contralateral corneal autograft was planned. The follow up period remained uneventful in the autografted eye and the intraocular pressure remained normal without any progression of the glaucomatous changes in the optic nerve. Whereas, in the allografted right eye, persistent epithelial defect occurred for which amniotic membrane was transplanted one month postoperatively. However, right eye developed severe vascularization and opacification of the cornea. This case demonstrates that autograft is definitely better tolerated than allografts with less frequent postoperative complications and quick visual rehabilitation. In conclusion, corneal autografts may be considered first in any case where there is this unique combination of opaque cornea in an eye with better visual potential and a clear cornea in an without visual potential due to the advantages discussed above. Arthur Boruchoff S, Dohlman CH (1967) Corneal Autografts. Am J Ophthalmol 63: 1677-1681. Gundersen T, Calnan AF (1965) Corneal autografts, ipsilateral and contralateral. Archives of Ophthalmology 73: 164-168. Pearson AR, Sandford-Smith JH (2000) Corneal autografts: Are the theoretical advantages achieved in practice? Eye 14: 99. 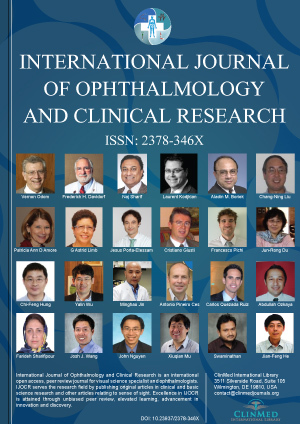 Tannen B, Zarbin MA, Bhagat N, Wagner R, Chu DS (2011) Corneal Autograft and Allograft in a 10-Month-Old Premature Boy With Acquired Bilateral Corneal Opacities. Cornea 30: 905-906. Bertelmann E, Hartmann C, Scherer M, Rieck P (2004) Outcome of rotational keratoplasty: Comparison of endothelial cell loss in autografts vs allografts. Arch Ophthalmol 122: 1437-1440. Perez-Balbuena AL, Ancona-Lezama D, Delgado-Pelayo S, Martinez JD (2017) Contralateral Autologous Corneal Transplantation Experience in Mexico City. Cornea 36: 32-36. Ophthalmic Surg Lasers (1998) A comparison of corneal autografts with homografts. Ophthalmic Surgery and Lasers 29: 305-308. Bamdad S, Malekhosseini H, Khosravi A (2015) Ultraviolet A/riboflavin collagen cross-linking for treatment of moderate bacterial corneal ulcers. Cornea 34: 402-406. Said DG, Elalfy MS, Gatzioufas Z, El-Zakzouk ES, Hassan MA, et al. (2014) Collagen Cross-Linking with Photoactivated Riboflavin (PACK-CXL) for the Treatment of Advanced Infectious Keratitis with Corneal Melting. Ophthalmology 121: 1377-1382. Sitaula Sanjeeta, Maharajgunj Medical Campus, Institute Of Medicine, Kathmandu, 44600, Nepal, Tel: +977-9803109483. © 2019 Sitaula S, et al. This is an open-access article distributed under the terms of the Creative Commons Attribution License, which permits unrestricted use, distribution, and reproduction in any medium, provided the original author and source are credited.